For those of you who do not know me – my name is Adam Poch. 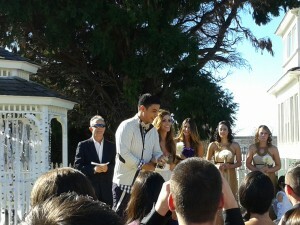 I was a contestant on CBS’ Big Brother 13. One thing I was known for on the show is my love of Bacon, which is why Rev & I have been friends for many years – after all, what goes together better than bacon & burgers? While being locked inside of a house playing a game for a half million dollars against random strangers, friendships form. Some of these friendships turn into showmances. In the first few days of getting to know each other, I would see my house guests Dominic Briones & Daniele Donato joking around in a flirtacious way. While neither one of them would say they “liked” the other – I could tell there was something more there. Think back to when you were a kid in elementary school and you would tease that boy or girl you had a crush on. This was how their flirtmance was going. Despite Dominic leaving in the 3rd week, Daniele would still talk about him in the same way. After they both were back into civilization, their flirtmance grew into a real relationship. 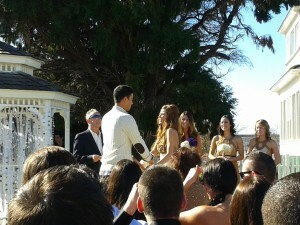 It was no surprise to me when they announced (to a small few) that they were getting married. On a sunny January day in Huntington Beach California they were wed. Surrounded by family, friends, and some Big Brother Alumni – we watched as they read their own vows and declared their love for each other in a beautiful ceremony. 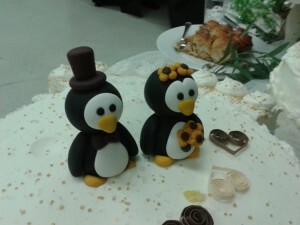 Their love for penguins (because they mate for life) was evident as they had April’s (from BB6) son dressed as a penguin as ring bearer – and a husband & wife penguin as their cake topper. I may be a metal head, but I do have a soft side – and seeing these 2 together, you cannot help but feel the love! When I found out I was going to Huntington Beach – I remembered that a Slaters 50/50 opened up there a little more than a year ago. As any good bacon fan knows – this place is known for their 50/50 blend burger. It’s 50% ground beef & 50% bacon. One look at their menu – you will see they take their bacon seriously. Fried Bacon Mac & Cheese balls, Jalapeno Bacon Mac & Cheese with Beer Cheese sauce & Cheeze-It crust, Fried Chicken covered in bacon-infused country gravy (and bacon) between 3 buttermilk pancakes, Maple Bacon Milkshake, Bacon Brownies covered in candied bacon & chocolate ganache, and even have a Maple Bacon Beer made just for them called Latitude 33 Slater’s 50/50. Since I had only heard about this place from other bacon lovers & seen a few things here and there on TV – I had to go there. So the day after the wedding a few of us headed over there to watch the NFC & AFC Championship games. I started with the Latitude 33 – and the bartender kicked it up a notch by putting a huge strip of bacon in the beer for me. Kind of like a kid with fun dip – I was sticking the bacon into the beer and lapping it up. The next thing I see, the bartender is making these 2 shot-glass shots and putting bacon in it. I had to ask what it was. 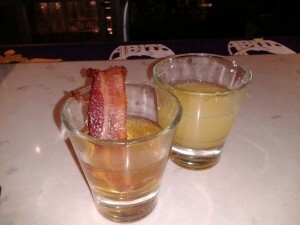 They call it the breakfast shot – one glass has Jameson & Butterscotch Schnapps with a strip of bacon, the other glass has orange juice. The order goes, drink the Jameson/Butterscotch – eat the bacon – drink the OJ. Your mouth will taste just like you had a big Sunday morning breakfast. 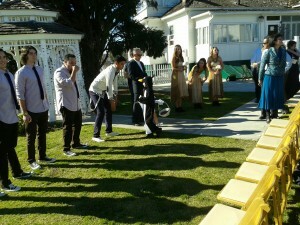 While I sipped on cocktails – I was paying almost as much attention to the food that was being served around me as I was on the football games. Everything looked so good, so as soon as the bacon monster inside my belly could not take anymore – I grabbed a pencil and my “Design It” form. Yes – they have their own combinations of burgers on the menu to choose from, but I needed to “Adam” it up. First choice was what kind of meat. 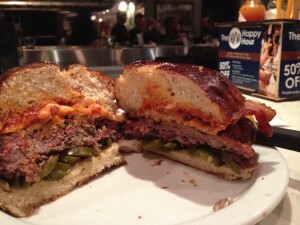 Well, this was a no brainer – the 50/50 patty. But to take it to the next level – I had them mix in their Fire Beef as well (beef with hot peppers) 1/3 lb of each. Next the roll – once again, duh – the Bacon Pretzel Roll. Now what cheese would work on this burger – the Bacon Cheese of course – which is basically american cheese with bacon in it. Now it’s time to decide what other toppings I would put on my creation. Jalapeno’s? SURE! House Made Bacon Infused Country Gravy? Let’s party! Thick Cut Bacon? Like you even had to ask me. And a bit of Bacon Ketchup to bring it all together. Another fun part of making your own burger is you get to give it a name. 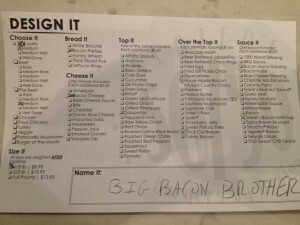 Well, since I was here with some of my Big Brother Alumni – I called this – the BIG BACON BROTHER! As soon as I gave it to the bartender to bring back to the kitchen, I started getting antsy. “Where is my burger? C’mon already – bring me my Bacon Frankenstein! !” As soon as I saw the server turning the corner – I knew, it was time to chow down. The only thing that disappointed me at first was there was not enough of the Country Gravy – so I asked for more. They brought me out a bowl – which was perfect as I dipped each bite into the white salty chunky goodness! Halfway though the burger – I started to sweat. 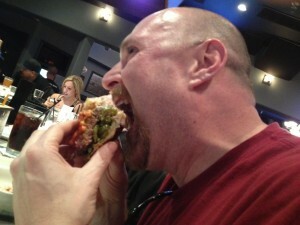 I can usually take Jalapenos with ease, so there had to be some really hot peppers in the Fire Burger portion. Or maybe I was just getting the meat sweats. Either way – this was heaven on a roll. I was sad when I realized I was down to my final bite for this was a burger I had read about, seen on TV, and dreamed about for a long long time – but that did not stop me from putting that morsel of goodness in my mouth and savoring the final few chews. A couple minutes later – when I came out of my Bacon Nirvana trance – I leaned forward and said to the bartender – “THAT WAS F**KIN AWESOME! 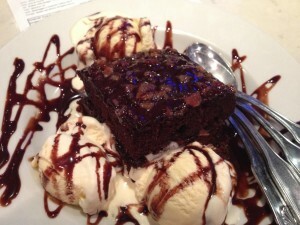 Now dessert me my good man!” Yes – I was going to get the Bacon Brownie. This was not my first bacon brownie – but it was my first bacon brownie sundae and I slurped up every last bit (with a little bit of help from my friends). 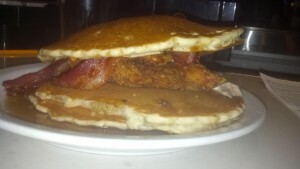 The bacon monster inside of me was still not done – and when someone got the Chicken & Pancakes – I had to take a few forks full. Just as delicious as everything else I had sampled on this fine day. The only thing Rev would not like about this burger – is the 50/50 patty has to be cooked Medium, Medium Well, or Well Done. But this is nothis review, this is mine – so I am giving this a 10 out of 10 ounces. Not just for the burger – but for the whole Slaters 50/50 experience! This entry was posted in Bar, Burger Famous, Burgers, Gourmet Burgers, Hamburgers, Los Angeles and tagged adam poch, bacon brownie, bacon burger, best burger, burger conquest, cbs big brother 13, cheese, ciancio, Dominic Briones Daniele Donato wedding photos, french fries, guest blog, hamburger, heavy metal teddy, Huntington Beach California, nyc, penguin boy, rev, review, slaters 50/50, the rev meter for social community. Bookmark the permalink. That burger sounds ridiculously delicious. I want some now! Since when does Dani loves so much penguins? Since BB11? Because the story about penguins mating for life all started then with Jeff & Jordan. Remember? and also remember that evening BB13, you were playing pool with Jeff and told him Dani had a crush on him and Brendon, remember the cool evening she glued in the BY in her very short short….u whistling : The longest day…when she went to bed..finally! Remember her being so depressed at her birthday…..: hopeless….rush…D=by default ….etc..excuse my english..I am french and excuse me rudeness and tackyness..i learn english watching BIG BROTHER. Your post is so ridiculous, it’s hilarious. Rewrite history much! Jeff and Brendon both had a crush on Dani. As far as Penguins go, Dani would have no idea Jeff even talked about the movie, since he did that in S11, which she was not on. What does that have to do with anything? She wasn’t depressed on her birthday at all, other than being on slop for the week. Everything is not about Jeff and Jordan and their obsessive, compulsive fans. Actually most alumni DO NOT like Jeff and Jordan and I can see why. If you were smart you would had realized that Dominic was waiting for marriage and penguins mate for life with one penguin. Dominic is her penguin. (Twitter Picture)Daniele said many times that she didn’t watch BB11. The only animals that I remember Daniele talking about are unicorns. Also what I don’t understand is to why people won’t let her (Dom too) be happy and not just question everything they see with invalid points. Out of all the BB couples we know the least about them together and separately. Many people didn’t even know they were even dating. Why cause such Drama? Let them be happy… Congratulations to them. As far as Jeff and Jordan seems they are doing fine also So Let’s all just let everyone Be Happy with their own life. We have our own to take care of. Remember it’s all about rainbows unicorns and Butterflies.. Bless them all and wish ALL of them the Happiness in the world. It’s cruel enough without being Judged by outsiders who watch a reality show for entertainment this is their REAL LIVES! God Bless!!!! 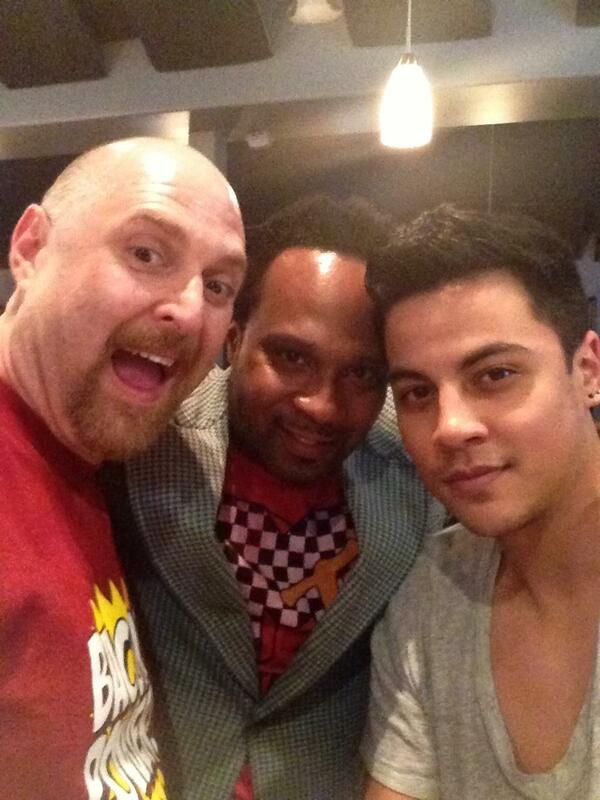 Thank you ADAM for loving my FAV COUPLE Daniele Donato and Dominic Briones…. 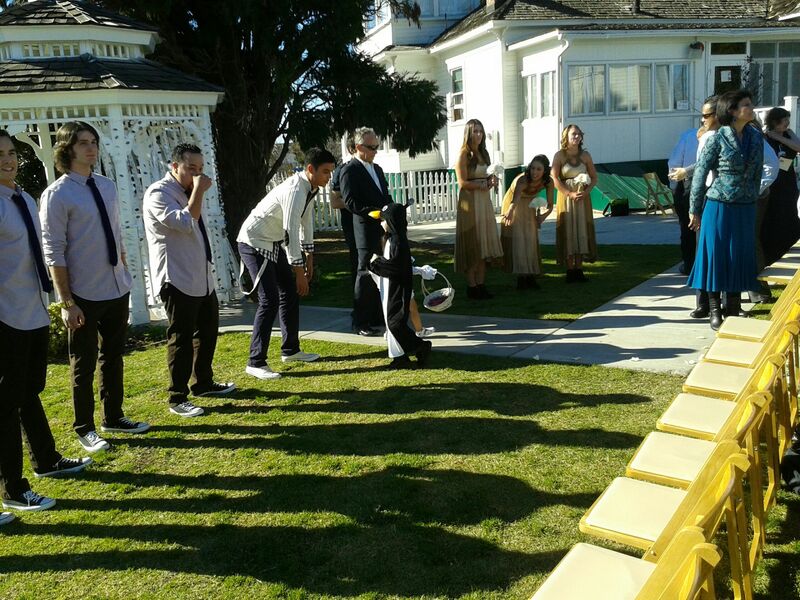 I wish them all the best in Life….